We spoke to PRWEEK recently about the anti-diversity memo crisis at Google. There were questions about how Google was handling the issue given their silence. Then CEO, Sundar Pichai, stepped in, cutting short his vacation stating the content was ‘not OK’. Danielle Brown, VP of Diversity, Integrity, and Governance, also condemned the memo’s comments for advancing ‘incorrect assumptions about gender’. Google was caught in a cleft between promoting disparate thinking and endorsing discriminatory statements. Ultimately the author of the memo, James Damore, was fired. However, since this article came out, the issue has continued. The ‘clear the air’ all-hands at Google was canceled amid fear of online harassment of staff, and Damore contends his ouster was the unfair action of ‘Goolag’ management. Unrepentant, the author now has a public name and a face and has taken to Reddit to defend his stance. Further, some are now calling for Google’s CEO to step down on the premise that Google is punishing those who disagree with its worldview – a dangerous development given the amount of data it has on each of us. The issue – diversity in Silicon Valley is one of the touchstone topics of today. This crisis breaks hard on the heels of the Uber, 500 Startups and Binary Capital fiascos, which had already resurfaced tensions from the Pao vs Kleiner Perkins case of 2015. Gender and racial equality are being mandated at many tech companies, victims are gaining confidence and a ready audience. Into this hotbed drops the Google memo like a potassium fireball. 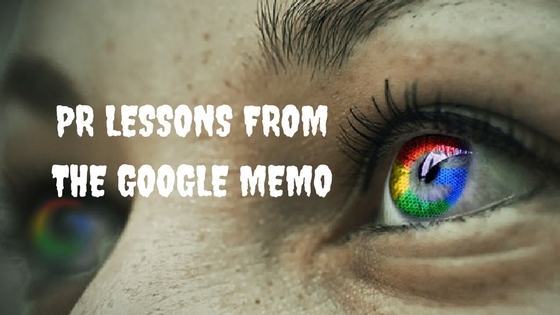 The company – we love to use Google’s products, but gone are the days of ‘Do No Evil’. The story arc around Google, which has become such a juggernaut, is to find the counter stories to success. Google isn’t the villain but there’s a keen appetite for contrarian stories like this one. The timing – here we are in the news doldrums of late July and early August, meaning that in tech circles at least, there is plenty of ink to spill on this story. Plus it breaks over a weekend, when the CEO is on vacation. Nightmare. The topic – the challenge here, particularly for a company which values curiosity and open debate like Google, is that the memo was hard to unequivocally deny. Google wants to encourage debate among its 61,000 employees. It wants diversity of opinion (and in fact that’s what the memo was about). It values freedom of speech. But at the same time, it must provide a safe working environment for its staff and cannot countenance a viewpoint which seems inherently discriminatory. So on the one hand, if they slam the author, they look as if they are quashing debate and are opening themselves up to punishing ‘thoughtcrime.’ While on the other, they cannot allow female staff to feel unsupported or as if their actions are being judged as stereotypical and gender-bound. The author – you have to be smart to become an engineer at Google, and Damore is no exception. His memo was supported by research, which many vehemently questioned or disagreed with his interpretations. The quality of the ‘science’ and debate about its validity and applicability was another source of fuel for the debate. Other complexities – Damore didn’t take his sacking lying down and found a ready reception in a series of media interviews including that Reddit AMA, and interview with Bloomberg and an oped in The Wall Street Journal. He’s fanning the flames. Added to this is an impending lawsuit for wrongful dismissal which will extend the arc of the story as it unfolds. So what can startups do? Clearly, the main priority is to be genuine and serious about diversity within the organization. Google is a sophisticated and progressive organization. It has a senior executive who is responsible for diversity, yet even it fell short here. Some introspection followed by action is warranted, even for companies with programs in place. Ensure that lines of communication are open between HR, comms and executive management. Make sure the company is truly listening to its staff and shaping its culture to respond quickly to issues and to shape policy. Ensure the values are clear and that the code of conduct is well-known. A startup’s issue might not stem from a provocative memo, but a more direct incident at a social event for instance. These issues can be prevented by being clear about expected behavior – and having senior management exhibit and enforce those norms. We haven’t seen the end of the Google Memo crisis. It’ll rumble on with the lawsuit and resurface as issues in other companies arise. It may yet claim the scalp of the CEO which demonstrates the seriousness of this issue. Let’s hope it spurs more tech firms to invigorate their diversity programs. If not, they should be asking themselves – what will?